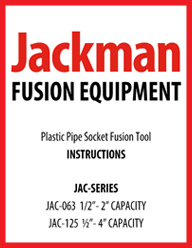 Jackman Introduces its JAC-063 Manual Socket Fusion Welder for heat fusing Socket Fusion style fittings and pipe. The JAC-063 has a working range from 1/2" IPS to 2" IPS and welds various materials including HDPE, MDPE, PPR, PP , PVDF and PB. The welder is composed of a heating plate, digital temperature control display screen, and a comfortable nylon plastic handle shell. Digital Adjustable Temperature Regulator (Factory Set at 500 Degree F). The analog thermometer on the welder is a helpful secondary measure to confirm and ensure temperature accuracy. Dimensions (LxWxH) 18" x 6" x 2.5"
Electronic Heating Tool Only. Sockets Sold Separately. 2 Year Jackman Fusion Manufacturer Warranty. Click the button below to add the JAC-063 Socket Fusion Welder to your wish list.